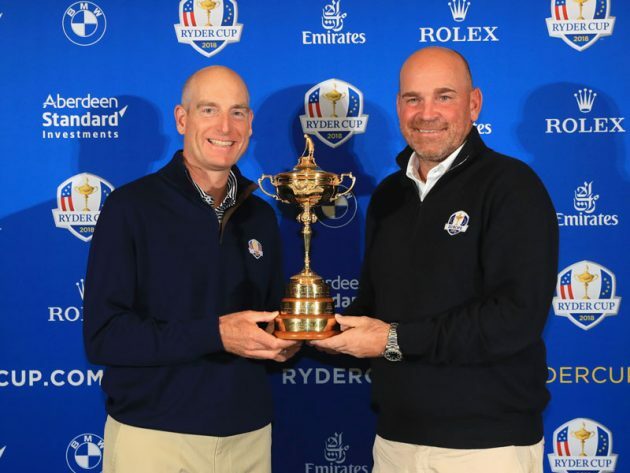 Being a Ryder Cup captain is supposed to be a great honour and the position usually goes to a player that has shown great poise under pressure, one who has fashioned a long list of achievements including past Ryder Cup glory. But it seems that the job comes with its own pressure too. The captains are selected two years before the Ryder Cup matches are actually contested and the media incessantly bombards the poor guys with inane speculative questions about who they might pick if a certain player doesn’t make the team on points. And for some reason, they’re supposed to atone for all past Ryder Cup losses and promise their team won’t be another victim. It’s probably a relief when the matches finally get underway. Apart from the media pressure though, the job of being a Ryder Cup captain is actually pretty easy. They really only have three important decisions to make: add a few players to the team to round out the squad, shuffle the line-up cards for the matches each day and select the team shirts. Shirts? How tough could that be? The sponsors of each team are selected far in advance by the Ryder Cup committees so it’s not like a captain can wake up one morning and decide to go off the charts and select Loudmouth shirts and pants for his team. 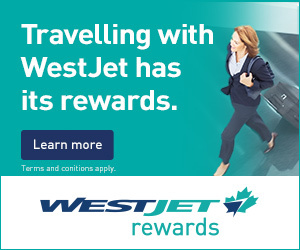 The choice is just about patterns and colours. For the USA, this should be a no-brainer. Just pick some combination of red, white and blue for all three days and mix some stars and stripes in to the patterns for added incentive. Also, if Tiger Woods is on the team, make sure to have red the dominant colour on Sunday. That should suit Captain America Patrick Reed too. For the European captain, the choices are much tougher. Originally, when the team was just Great Britain and Ireland, the red, white and blue of the Union Jack mixed with a splash of orange and green from the Irish flag kept all the participants relatively at peace. Now that all of Europe is in the mix, yellow, gold and several different shades of green, blue and red are available along with black (Germany, Belgium). White is still white, but the Euros seem to like that colour for their pants. Thomas Bjorn can probably go with any colour he wants for shirts, except maroon. There are no players from Latvia on the team. Since the 2018 matches are in France, there probably should be a nod to that country’s national colours which are … red, white and blue. It’s not that wardrobe selection is totally without controversy. Two notable occurrences illustrate the potential for disaster. 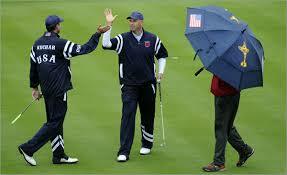 In 2010, American captain Corey Pavin took his team to Celtic Manor in Wales. It’s no secret that it rains in Wales in October. A lot! Sun Mountain outbid other sponsors for the opportunity to supply the US team with rain gear that year and it was left to Pavin and his wife Lisa to pick the design. The inclusion of wives in selecting team wardrobes is a long-standing American tradition dating back to Martha Washington, who selected the general’s outfit for the famous crossing of the Delaware prior to the first matches between the Americans and the British, sometimes called the American Revolution. When Pavin was announced as captain, two years prior to the Welsh debacle, he stated that Lisa would be very involved in picking the uniforms. "Lisa has an unlimited budget with clothing at home, so I just want to give you guys a fair warning right now about the clothing," Pavin said that day. Well, let’s start with design. It was said by some that the blue rain gear looked like warm-up suits for a college basketball team, right down to the extra stripes on the arms and legs and the player names on the back. If the players were embarrassed, they didn’t let on and if it had just been a fashion faux pas, that could have been laughed off – eventually. But the suits didn’t work. The heavy Welsh rain soaked through and turned the Friday matches into a miserable slog for the Americans. The only saving grace was that the course got drenched too resulting in a postponement of the afternoon foursomes. During the lull, much to the amusement of the European players, Pavin took his team to the pro shop and bought suits made by the same supplier that the competition was wearing. It was very embarrassing. The USA didn’t win the Ryder Cup that year either. Perhaps the strangest fashion choice though was made in 1999 by US Captain Ben Crenshaw. He and wife Julie (of course) selected a maroon shirt with beige collar and cuffs and festooned it with more pictures than you’d find on a fridge. Each of the black and white pictures was from past Ryder Cup glory. To say the shirts were ugly was a gross understatement. The Americans won the first six matches on Sunday and ultimately rallied to win the Battle of Brookline when Justin Leonard sank a long bomb on the 17th green to defeat Jose Maria Olazabal, capping the biggest comeback in Ryder Cup history. The celebrations were over the top, including American players rushing the 17th green to congratulate Leonard, even though Olazabal still had a chance to tie. 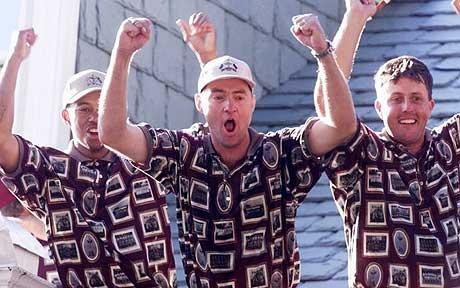 Images of American players celebrating in those shirts will forever be a stain on Ryder Cup history. Tiger Woods says he burned his but if you’re a fan, there’s a current auction for an authentic 1999 Ryder Cup shirt signed by all the players. The current bid is in the $3500 range. One hopes that neither Jim Furyk or Thomas Bjorn will be as adventuresome with his wardrobe selections. As for the other captain’s choices to be made in a couple of weeks, those are easy. Woods, Schauffele, Kuchar and Finau for the Americans. Sorry Phil. And Poulter, Stenson, Knox and Pieters for Europe. Sorry Sergio. How tough was that? The shirts will be way more difficult.